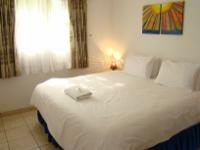 Double room with double bed, (beds can be arranged to 2 single beds for non couples who want to share ) en suite bathroom & shower, hospitality tray fridge microwave, utensils. Free WiFi, TV with DSTV. If cancelling 7 days before arrival, forfeit 50% of the booking total. If cancelling 14 days before arrival, forfeit 37.5% of the booking total. If cancelling 21 days before arrival, forfeit 25% of the booking total. If cancelling 28 days before arrival, forfeit 12.5% of the booking total.